I think birthdays are a big deal. It's nice to set aside a time to give thanks for and celebrate a life and if we can do that well once a year, then a child has a nice patchwork of lovely memories with which to wrap herself when she leaves home. It gets a little tricky, though, when a family has four children born within the space of a single week. The child at the end of Birthday Week suffers a bit from a fatigued mama and a sugar meltdown. This year was particularly challenging because we threw in a road trip for UVa soccer and a date night for our high school reunion. Karoline turned seven on Friday. We did some creative tweaking of traditions to be sure that she had exactly the day she wanted--even if it took several days to make it happen. The day began with breakfast in bed and many sleepy siblings singing Happy Birthday. She insisted on wearing her new birthday shirt (even though the shirt is flannel and it was ninety degrees). Before noon, Karoline and Mary Beth made cupcakes. And we ate them before noon, too, because we needed to hit the road. For every birthday, our family's tradition is to pray over the birthday girl and to give thanks for something specific we love about her. We sang happy Birthday, said our "what I love" prayers and watched Karoline blow out candles before our pre-lunch cupcake feast. Then, we piled everyone in the car to to head into the Blue Ridge. Since it was her birthday, Karoline got to pick drive-thru the meal.(Chick-fil-a. Please Cchik-fil-a. Please, please, please Chick-fil-a.) She chose Taco Bell. Awesome. Taco Bell in the car--my favorite. We drove first to Harrisonburg to pick up Christian. Christian is Karoline's godfather so she was delighted he'd be with her that day; her delight doubled when she found that he came bearing gifts. From Harrisonburg we went to Charlottesville, to the home where my father and stepmother live. There, we ate dinner, gathered more presents, and sang Happy Birthday again, over Texas sheet cake this time. That was the third birthday serenade of the day, but who's counting? Back in the car to Paddy's game. She managed to tell several dozen more people it was her birthday and to stay awake all the way home, thereby not missing a single second of the birthday night and falling asleep well after midnight. On Saturday, after Stephen's soccer and before we left for the reunion, Mike suggested Red Robin for lunch. Why not? They sing a different rendition of "Happy Birthday." She'll take it. When Katie had her whole-day-with-mama shopping day for her birthday, Karoline said she wanted that, too. I promised we'd do it the Monday following her birthday since we'd be traveling on her birthday. Monday came and there were tornado watches and warnings, so she opted to wait another day. However, she remembered she'd never gotten to pick a birthday dinner, so we did manage to have chili in her honor that night. Tuesday came, and with it an opportunity to spend birthday money. After a quick hot chocolate treat, we stopped first at Target and were both disappointed by the proliferation of cheesy bling on little girls' clothes. So, we headed to the mall. Ordinarily, I'm a twice-a-year mall shopper and then only when I have a specific purpose. This was to be the second time in a week! Lo and behold, there was a Birthday Miracle. Everything at Gymboree was $16.99 or less. That means if a pair of boots had a $52 price tag, they were $16.99. Same with winter coats. Dressy dresses? All under $17. I felt like I'd been dropped in a dream. I have felt that often in the past seven years. It's the Karoline's Charmed Star dream. After a very succesful shopping spree (where we spent Sarah's birthday moeny for her, too), we went to Whole Foods for lunch and groceries. She twirled in the parking lot. She twirled in the aisles. She twirled between the vegan curry and the sushi. And she said--loudly enough for lots of lunch hour business people to hear--"This is the Best Day Ever!" They don't know that Karoline has a "Best Day Ever" about twice a month. She had the whole place smiling. Despite my best intentions, there aren't many pictures to document her extended birthday celebration. I seemed to forget the camera at every turn. I'm told the ones I have are blurry (eye doctor again today, folks--a little St. Lucy prayer?). We took lots of snapshots in our minds though and the memories will be lovely patches in her birthday quilt. This night is fading into morning and soon it will be your birthday. You're curled up next to me and I watch you sleep. This is your "last night of being five." In the morning, it will be your sixth birthday. We'll go to tea together. Nicky will make you a four layer cake, exactly to your decorating specifications. Will that other front tooth come out? I think it might. But right now, in this moment, I want to capture you on the brink of tomorrow. Your sweet face, framed in curls, looks just enough like it did the day you were born that I can take myself back. Perfect baby. Every answered prayer in a sweet bundle with rosebud lips. You captivated everyone that day. We were forever changed. There is a collage of four black and white photographs of your newborn days that hangs at the top of the stairs. I stop, even if for only a moment, every. single. time. I never want to forget how I looked at you and knew that God had seen straight into my heart and smiled big when He handed you to me. For six years, you have danced your darling way through the life of our family. You are the first to soothe a hurt, whether it's a little sister with a stubbed toe or a big brother with a broken heart. You feel them all and you work your magic to make it all better. Ever generous with a hug and a smile, you exude genuine friendliness to every one you meet. You expect the best of people and you look for it so hard that you are rarely disappointed. Sarah Annie considers you her best friend. She is one really blessed little girl. There is no better friend. You love creation and you love the Creator. You've never met a turtle or a bug or a bird or a bunny that you didn't want to adopt forever. Most nights, your pockets are full of acorns and pebbles and you are always Most Likely to Hide Sticks in the Car so you can bring them home. Sometimes Daddy tries to stop you. Usually those big blue eyes persuade him otherwise. And God. Oh, how you love your Jesus! He is real and dear to you. You are our walking reminder on the ordinary days, in the ordinary moments, that God is near; God is here. Very matter-of-factly, you just beam it. And we believe it because everything about you says it's so. Every night, you fall asleep with your feet touching mine. Usually, you start in your bed and then, sometime before morning, you and your kitty pillow find their way into the big bed in my room. You curl up in the middle, seeking Daddy's comfort, and you manage to stretch out across much more than half the mattress. And we don't mind. No, we don't mind at all. Because we know how blessed we are to linger for a few moments in the loveliness of five and to awaken in the morning to the hope and promise and utter joy that is six. ~repost, because that's what we can do with traditions. If you've ever been to my house, chances are excellent to 100% that you have seen one of these prayer cards laying around. I ordered them in bulk when Karoline Rose was born to include in her birth announcements. And I've ordered more every year since. 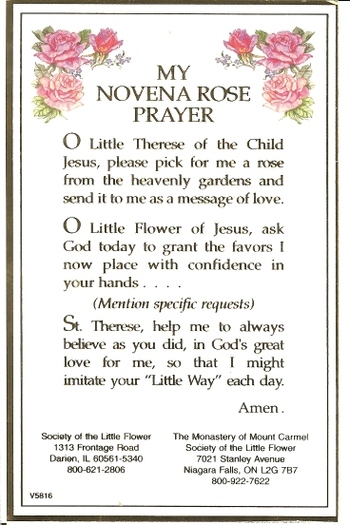 The rose novena is most definitely how we begin to prepare for the feast of this saint, who is so, so dear to our family. Karoline's name, of course is a tribute to St. Therese's promise to shower roses upon the earth and Karoline tells everyone she knows that she is, indeed, a rose sent from heaven. Katie was baptized Kirsten Therese, so she, too, is named for St. Therese. And there is lots of evidence of her presence on this blog because there is lots of evidence of her presence in our lives as a family. We will go to Mass, of course, to celebrate with the Universal Church. There will be roses. Michael is Katie's godfather and buys her miniature roses ("Little Flowers") on this day--just as long as I remind him;-). For this year, the girls are all abuzz about this pan, I purchased last summer. So, a rose-shaped cake. But I'm still not sure what the recipe will be. Any suggestions would be most welcomed in my inbox. Extra points if you have a grain freen recipe that works in a pan like this. It's a season for miracles, no? One of Trish's candles (in that amazing St. Therese rose scent) will be lit before the icon. Mary Beth took Therese as her confirmation name and Patrick's godmother blessed her with this beautiful image. I have learned over time that this is one feast I do not overplan, despite the fact that it is huge day in our family. St. Therese has a history of showering us with her love in most unexpected ways. The novena begins September 23, to prepare for the October 1st feast.